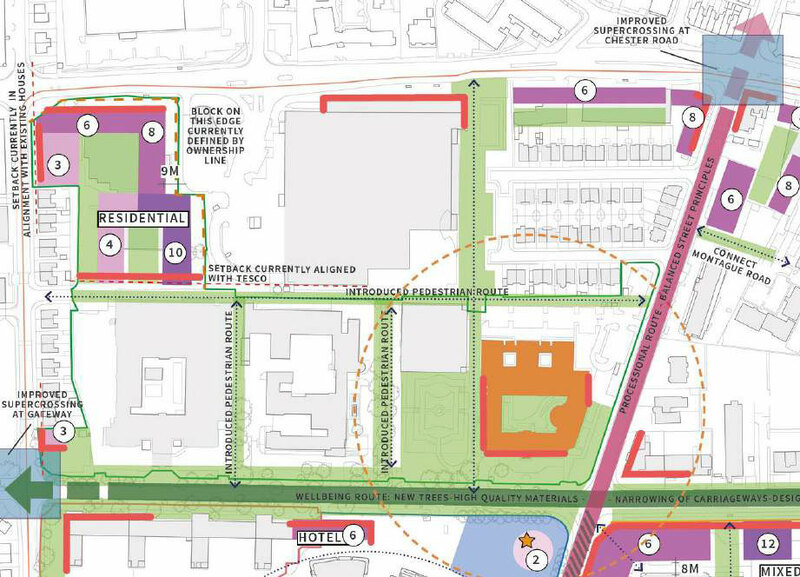 This change includes a welcome refresh of the Stretford Masterplan, now with less of an emphasis on UA92 and a revision to the contentious Lacy Street proposals. But before Trafford Council gets to that, they’ve moved ahead proposals for a Civic Quarter Masterplan. The masterplan covers the four quarters surrounding the Talbot Road/Warwick Road junction, going as far as Great Stone Road, Chester Road, White City Way and the Metrolink. 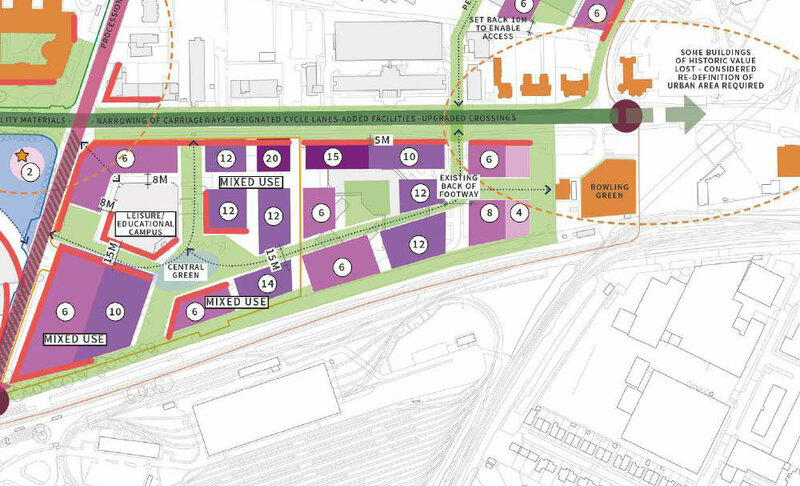 Included in the proposals are the areas surrounding Old Trafford Cricket Ground/B&Q site, UA92, Trafford Town Hall, Trafford College and White City Retail Park. Through a Spacial Development Framework SPD, Trafford Council has defined a set of principles that will be used to guide the redevelopment of the area. This includes the creation of high quality public realm, improved permeability and the creation of distinctive quarters, (1) Town Hall Quarter, (2) Leisure Quarter, (3) Campus Quarter and (4) Commercial Quarter. 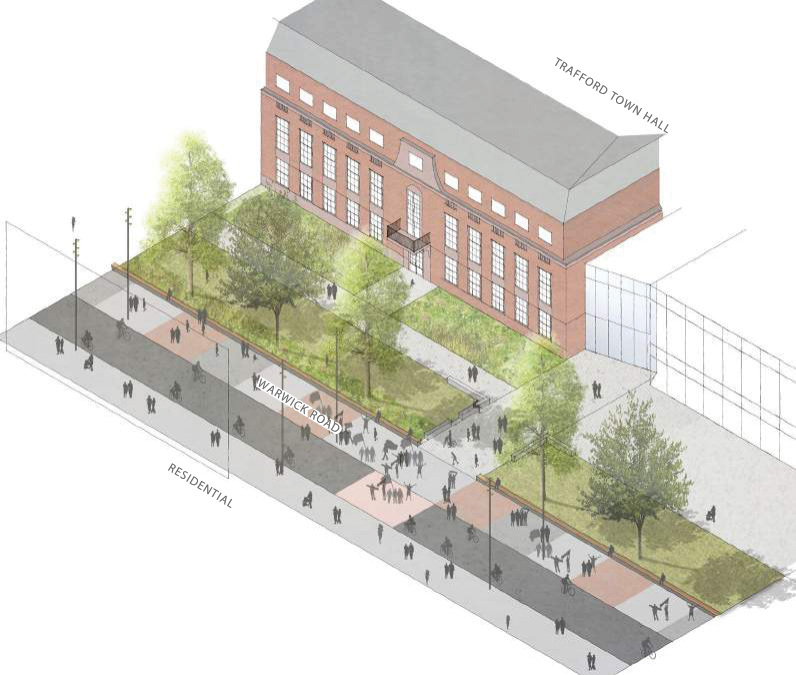 The vision for the Town Hall Quarter is to create a pedestrian-friendly and vibrant neighbourhood. This is to be achieved by increasing permeability for pedestrians, improving public realm connections and providing more green space. From a development perspective, there’s plans to develop the site of the current leisure centre for housing. There’s also plans to develop the corner of Warwick and Chester Roads. The latter is actually moving ahead already, with proposed plans for a new Hampton By Hilton hotel recently published. This all sounds good to me and I’m fully supportive of the proposals. I’m pleased to see more hotels come to the area. Given the attractions we have in the Civic Quarter, the number of visitors and the proximity to central Manchester, there’ll be no problem filling this hotel and probably a few more. The vision for the Leisure Quarter is to create a vibrant quarter celebrating wellbeing, sport and active lifestyles. The main focus of this is the cricket ground, with the land around it being opened up for pedestrian access, and the existing surface car parks removed. This will also help to provide better access to the Metrolink. 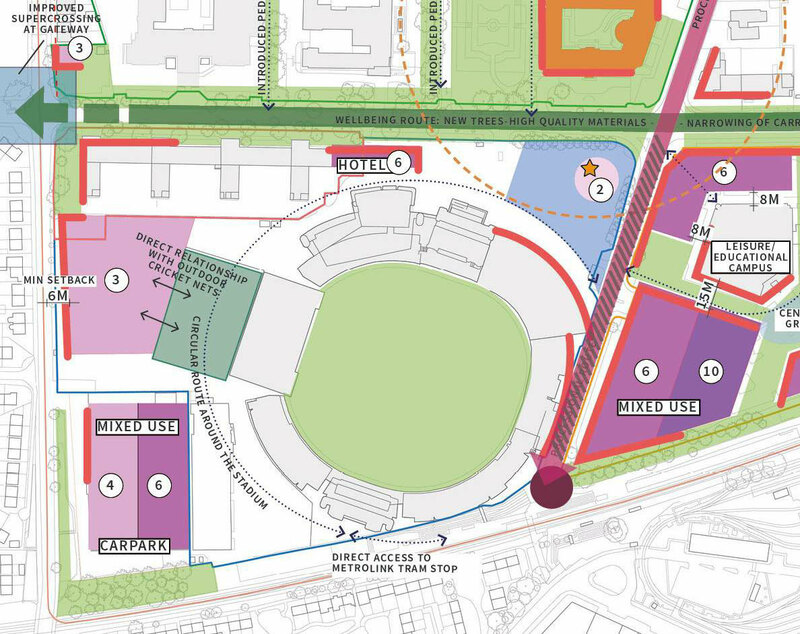 In a change to what was proposed in the Refreshed Stretford Masterplan, the proposal is now to move the leisure centre from its current site to the surface car park next to the cricket ground and old B&Q site on Great Stone Road. This will include connections to the cricket ground with indoor-outdoor nets for cricket. I’m not entirely sure how I feel about this. I was quite concerned about the previous proposals being so tied to UA92. Especially as the facilities were to be smaller than the current leisure centre and to be shared with students. Will these proposals be any better? There isn’t enough detail at this stage to really comment. The old B&Q site has been earmarked for a multi-storey car park. So that most of the car parking can be consolidated into a single location at the perimeter of the Civic Quarter. How locals will feel about this, I don’t know. And will all the car parking really be consolidated to here? It seems like the council themselves are planning to keep their current car parking. Some people have asked for the leisure centre to be relocated to the centre of Stretford, on the Lacy Street site. I personally don’t think the Lacy Street site is an appropriate location for the leisure centre, as I would much prefer to see the focus being to open up access to the canal, much like in Sale town centre. The leisure centre has been in the north side of Stretford for well over 30 years now, and I think it should remain there. The vision for the Campus Quarter is to create diverse, mixed-use neighbourhood to complement UA92. This will include attractive new green spaces and mixed-use development, ranging from 4 to 20 stories in height. The original focus of the Refreshed Stretford Masterplan was on the area around UA92, with hotels and a new leisure centre originally earmarked for here. With plans for UA92 scaled back somewhat, I expect the development here won’t be as focused on UA92, which is welcomed. There isn’t a huge amount of detail around this quarter, so it’s hard to form an opinion on it, until more is known about the actual developments. I’d imagine some might have issues with the heights. Though I think unlike the previous Lacy Street proposals, the heights are actually appropriate for this area. The vision for the Commercial Quarter is to maximise opportunities for the positive enhancement of White City Retail Park. This includes providing better pedestrian access to the retail park, traffic calming and an improved pedestrian experience. In addition to this, rationalisation of the car park is to be considered as well as development of up to 20 stories on some of the vacant areas of land. While there’s been big improvements to White City Retail Park in recent years, particularly in the selection of shops. Access to the retail park is really awful, whether you’re walking, cycling or driving. As there’s only access on Chester Road, it means a big detour when walking or cycling, unless you’re willing to brave the A56. Driving there is no better, with regular examples of people getting stuck in the car park in queues of traffic. Improving walking and cycling access to the retail park will make a massive difference to those in the local area and really open up access to the shops. Proposals for the Civic Quarter include the introduction of a wellbeing route along Talbot Road. The vision is to provide a health and well-being boulevard, while supporting the Stretford Cycleway that’s recently been built. Principles include accentuating the road’s green character, de-engineering the street and narrowing the carriageway. According to proposals, there will be a Beelines-standard designated bike lane, multiple road crossings and a supercrossing at the Great Stone Road junction. This all sounds very positive taken at face value, though I have a few concerns. 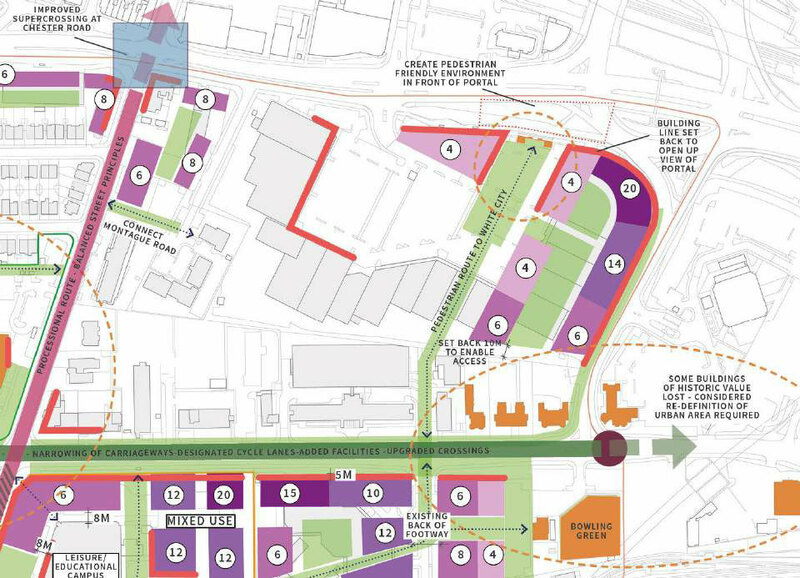 The visualisations appear to show a section of shared space for cycles and service access, with valuable space being given over to a running track. So, what will count as service access and how much traffic will be expected to carry? Along this section of Talbot Road, there will need to be service access to Trafford Town Hall, Stretford Police Station, Trafford College and the cricket ground. Currently, the police station has vehicles regularly responding to emergency calls, will this continue once the wellbeing route is in place? What about the town hall car park? It doesn’t look like there’s plans to remove this. What will happen to the buses that currently travel along Talbot Road, will they continue through the wellbeing route? What about Manchester United match days? Buses are currently rerouted from Chester Road to Talbot Road immediately before and after a match. And what will happen when there’s events on at the cricket ground? We currently see a constant stream of coaches and taxis along here. The Stretford Cycleway has brought much-welcomed protected space for cycling along most of Talbot Road. I’d be very unhappy to lose this and have to share space with buses, taxis, police vehicles and other service vehicles. Especially if the dedicated space for cycling was to be given up to provide a running track. route along Brian Statham Way and Warwick Road and a stronger connection between the two stadia. 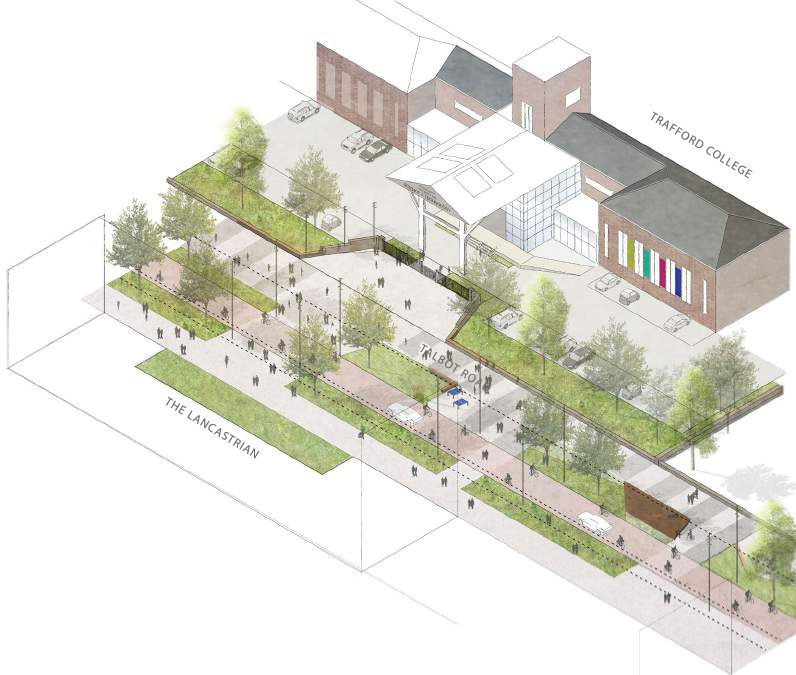 The principles for this are to include the pedestrianisation of Brian Statham Way, removal of the UA92/cricket ground fences, seating and space for active street frontages. Again, taken at face value, this all sounds very positive, but I have concerns here too. The visualisation appears to show some kind of shared space implementation on Warwick Road. Now, I’ve yet to see many, if any version of shared space in the UK that doesn’t disappoint. Whether it’s Exhibition Road in London, Poynton or Stamford New Road in Altrincham. Traffic levels often mean that motor vehicles end up dominating the space and people are forced to the edges. My concern here is we’ll get shared space that’s dominated by motor vehicles and is just unpleasant to be in, like Stamford New Road is. While this investment in the area is very welcome, the (white) elephant in the room is still Stretford town centre and Stretford Mall. Unsurprisingly, many people are asking why the focus is on the Civic Quarter and not the town centre. 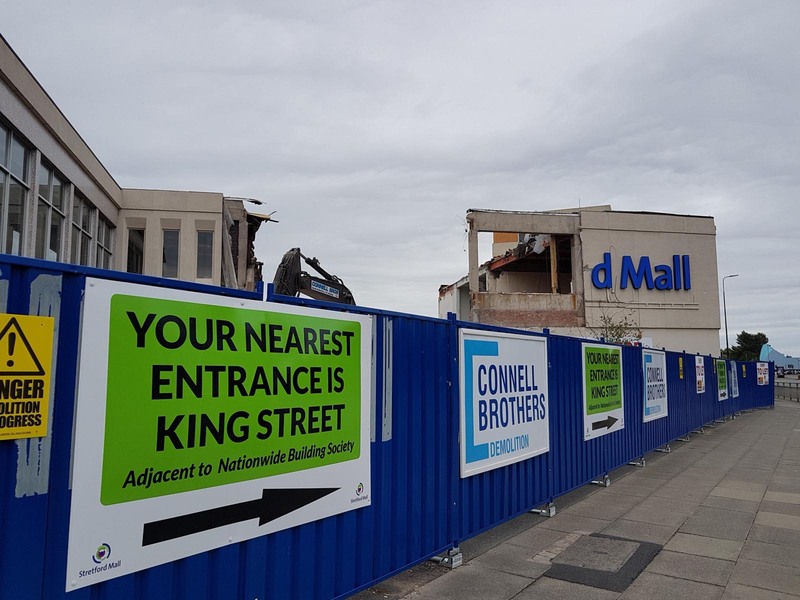 The current demolition of a section of Stretford Mall, is it enough to turn it around? While I don’t have a problem with work moving ahead with the Civic Quarter first, I do think we need to see the council intervene with the town centre and Stretford Mall. Work has started progressing on a scheme for the Lacy Street/Edge Lane area nearby. This is a positive step, but it doesn’t seem like it’s enough to revitalise the town centre. Ultimately, Stretford Mall just isn’t fit for purpose for 21st century. This type of indoor shopping centre just isn’t appropriate in a modern town centre and the needs of local residents. While the current demolition work might have a positive impact, it doesn’t appear to be enough. What we need is the full demolition of Stretford Mall and the reinstatement of streets that are open 24 hours a day and easily accessible by foot or bike. With that, Stretford could have the nighttime economy it desperately needs, with places to eat out and drink in, not just takeaways. If this was done as part of a new masterplan for the town centre, with a mixture of retail, leisure and residential development on the site, it would easily pay for itself. This is a significant piece of land, particularly if you put all that surface car parking to a better use. The council may point to the shopping centre being privately owned as the blocker to them getting involved. This hasn’t stopped them buying the Grafton Centre in Altrincham and the magistrates’ court in Sale. It would be really good to see the council show real commitment to Stretford and step in to sort out the town centre. Overall, it’s great to see a fresh approach from Trafford Council and to see that they genuinely seem to want to improve the area. This is refreshing, after the many years of neglect from the previous executive, who cynically focused their efforts in the south of the borough or marginal areas like Urmston. It seems the council do actually want to engage with local residents, as demonstrated by some of the recent events to gather people’s opinions. Again, this is a very different approach to the last executive, who just presented completed proposals and saw consultations as box ticking exercises. There are concerns though. While these proposals appear to focus on improvements for walking and cycling, I feel that the council still don’t get walking and cycling and what it really means to prioritise active travel above motor vehicles. This is best demonstrated by the recent rather contradictory messages on Twitter from the council. One week urging residents to do their bit to help cut air pollution, then the next week promoting their ‘Free after 3’ parking scheme. All this coming from the executive member for Environment, Air Quality and Climate Change, who really should know better. Trafford Council clearly have a lot to learn. I’m worried that while the council might set out with the best of intentions, we could easily end up with something as bad as Altrincham’s Stamford New Road. This would be a disaster for the Civic Quarter. Though I hope the inclusion of Beelines-standard cycling infrastructure will mean this won’t happen. While the disastrous and very unpopular Stretford Public Realm scheme was the work of the last executive, it was supported by many of the local councillors in the Stretford and Longford wards. I believe they let the people of Stretford down by accepting and backing what was quite frankly a pile of crap foisted upon us. While the rationalisation of surface car parking in the Civic Quarter is a positive step. I would like to see the number of proposed parking spaces reduced further and see some real ambition from the council to get people out of the their cars and onto public transport or active travel. Most of all, what I’d really like to see is someone at Trafford Council who’s dedicated to walking and cycling, to ensure that the council fully embrace active travel and seize the Beelines potential. That’s how we can truly transform Stretford for the good. Agree with a lot of what you say. The devil is in the detail and I’d like to know how much if anything is expected from UA92 and LCCC towards costs involved in some of these ideas – particularly as UA92 is a private for profit university and LCCC have already benefitted substantially from the Tesco deal a few years ago. Also, I’d love for someone from the council to support a plan to put Chester road in tunnel between the M60 and the Bridgewater canal. There’s no hope for the town centre while this road splits the town centre in two, and there’s no hope for improving air quality or providing safe cycle and pedestrian facilities until it is removed from ground level. The extra land freed up by having only a small local road could be valuable for development and meaningful public realm improvements as well as creating an outward looking shopping centre and links to the canal and metro etc. other schemes get money, we just need someone to champion stretford’s cause. Money from northern powerhouse? Air quality improvement money? Divert a little bit from HS2 into something more useful? I suspect LCCC won’t be paying a penny as they’ll see the work as return for use of their land. I agree, Chester Road will always be a problem until something’s done about it and I support the principle of a tunnel. Though having a tunnel entrance near the canal/Longford Bridge is wrong in my opinion. A tunnel entrance here would have a significant negative impact to the area around it, which is mostly residential and includes two schools. The tunnel should continue to the White City roundabout, which is a much more appropriate location for it. It also means Gorse Hill benefits from the removal of traffic, which is also negatively impacted by Chester Road. Unfortunately, I think this kind of thinking is way beyond realms of the current exec in Trafford.